Café Integral is in Nolita in lower Manhattan, one street over from the Mott Street Café Grumpy and just a couple of blocks from the original coffee bar inside American Two Shot. This sadly closed soon after Elizabeth Street opened, American Two Shot’s owners needing more space for retail. With the standalone coffee shop up and running, it made sense to all concerned to close the coffee bar. 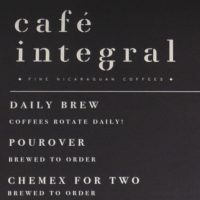 Café Integral also opened a coffee shop inside the Freehand Hotel in Chicago, and, following on from that success, two more have opened in Miami and Los Angeles, although the Miami branch was closed for a while after hurricane Irma in 2017. All of this makes Café Integral a national chain (sort of), although all the coffee is still roasted across the East River from Elizabeth Street in Williamsburg. I was very much a fan of the original Café Integral in American Two Shot and liked the branch in Chicago so much that I stayed in the Freehand Hotel the last time I was in Chicago just so I could go to the coffee bar every day. I was therefore largely sold on the Elizabeth Street coffee shop before I ever set eyes on it. It’s a simple space, the counter occupying the rear third of the store, stretching across its full width. The door is offset to the left, a square window to its left, a double-width window to the right, each window with its own bench outside. Inside, an L-shaped sofa-bench occupies the left-hand window, before running up the left-hand wall. This has a conjoined pair of low, round coffee tables with a couple of low stools for additional seating. Further along, a couple of stools perch at the left-hand end of the counter, while the remaining seating is on the right, a four-person bar in the window, with a four-person communal table between it and the counter, the actual seats all provided by stools. The counter’s layout is just as simple. A large glass display case in the centre splits the counter in two. This holds the cakes and pastries, a tempting array which includes a wide variety of Du’s Donuts. If you want something more substantial, the Egg Shop (which does what it says on the tin) is literally next door, and also serves Café Integral’s coffee. To the right of the display case is the till, where you order, while you’ll find the coffee operation to the left, with the two-group La Marzocco Strada taking centre stage. If you want a non-dairy alternative to milk, Café Integral makes all its own nut-based milks on site. One of the (many) things that I liked about the Chicago branch was the cups and jugs that the coffee was served in, all made by a local ceramicist. It turns out that Café Integral likes them too, since all the coffee in Elizabeth Street is also served in the same ceramics, shipped in from Chicago. There’s a variety of shapes and sizes, from neat, compact espresso cups, to large bowls that are used for the 10oz drinks. I decided to try the single-origin espresso, the El Bosque, a naturally-processed catuai varietal, produced by the Valladares family. A fruity, acidic coffee, it was really bright. I mean, really, really bright. The first sip was akin to a brief punch in the mouth, but it calmed down and played nice after that, turning into a rather enjoyable drink. December 2018: Café Integral, Elizabeth Street was a runner-up for the 2018 Best Overseas Coffee Spot Award. If you enjoyed this Coffee Spot, then take a look at the rest of New York City’s speciality coffee scene with the Coffee Spot Guide to New York City. This entry was posted in Cafe/Roaster, Cake, Coffee Shops, Laptop Friendly, New York City, Retailers and tagged include by Brian Williams. Bookmark the permalink.